Marxtermind isn’t foreign to two-day getaways nor writing about them. Just check out our our fleeting visit to Busan and you’ll understand that spontaneous travel, is the best form of wanderlust. However, Vancouver is obviously a different proposition to Busan altogether. Firstly, it’s a major Western city that in all honestly, needs about a month to unearth all of its hidden gems aside from the standard tourist attractions that usually fill up travelers’ bucket lists. Secondly, it’s a little further away, and if it wasn’t for work purposes, then the proposition of staying longer might be a reality. Getting from Manila to Vancouver is now easier thanks to a direct flight, however it does take 11 hours and 50 minutes, and when you have a slew of meetings at the other end of a flight, it’s a daunting prospect. But enough about work! Arriving on a Saturday morning means that it was the perfect time for sightseeing as there’s always plenty going on in Vancouver during the weekends, albeit it, it was much busier than expected. The weather in February isn’t the best, and if you haven’t experienced the harsh winters of Vancouver, you’re in for a treat. So, without further ado, here is a run down of the things that kept me busy during my weekend in Vancouver. The image above is not the image I was met with on my trip. That picture is from a rather more forgiving month of the year. But regardless of weather, the VanDusen Botanical Gardens are a must-see on your trip to Vancouver. There are always a selection of exhibitions on show at the VanDusen Botanical Gardens. This year for instance, there is the Library Exhibition by Marion-Lea Jamieson featuring a series of 12 paintings entitled ‘Vegetable Kingdom’, Fin and Feathers which will feature paintings by celebrated artist Jo Scott-B and the VBGA Volunteer Photo Contest all being held in March, so it’s an extremely busy schedule and one that is perfect for keeping tourists engaged. The Botanical Gardens opened in 1975 and features ponds, 1000s of species of plants, trees, shrubs and is a tranquil, and beautiful setting that is visited by millions of tourists each year. The gardens cover 22 hectares so it ideal to reserve half a day to walk around it. As a life-long soccer fan, whenever I travel to cities the first thing I look for is if the local team is playing. Fortunately, the Whitecaps were playing LA FC during my trip to the city. It was only a preseason game but it was a wonderful experience. The game ended 4-4 with some of the first team squad playing in the game in preparation for the upcoming regular season. You can read the report from the game here on the Whitecaps’ official site. There’s also a video on there, which shows some of the action from the high scoring game. So it’s safe to say that I am now a Whitecaps fan and will follow their results for a long time to come. I had heard great things about Fairmont’s Botanist. The sushi above is just a snippet of the culinary delights I enjoyed during my two-hour feast. The restaurant is run by celebrated Chef Hector Laguna who sources the freshest local produce from British Columbia and the Pacific Northwest. His menu revolves around contemporary takes on classic seafood dishes and prides itself on organic produce from the state’s local farmers. It was a great way to end the trip, and although I didn’t get to sample as much of Vancouver as I wanted, Botanist was a great finishing point. 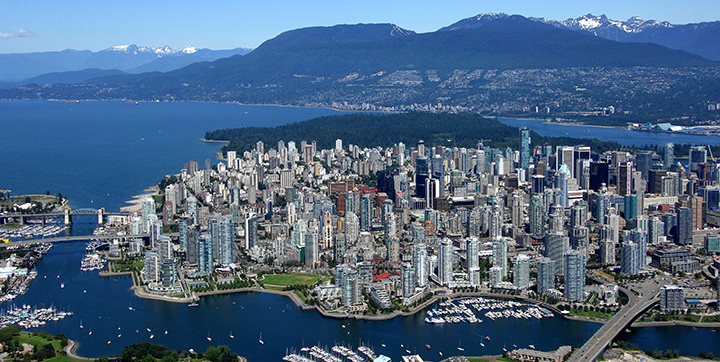 It’s located in the center of Coal Harbour in Fairmont Pacific Rim. You can have a read of the menu and follow the latest updates from the restaurant here on Botanist’s official Facebook page. If you have any further recommendations to add to the list, then by all means comment in the section below. I will be returning to Vancouver in late May so the suggestions would be welcome. Marvin Lovoe: After bumbling his way through college and writing for a series of college publications, Marvin has now succumbed to the dreaded world of a 9-5 corporate job. In his spare time, he travels, a lot. He also plays the guitar, while thinking about the next country he’s going to visit. He also lives in metro Manila.